Home / Barbados Postmarks / What makes a common stamp a real rarity? What makes a common stamp a real rarity? Sometimes, the commonest stamp can be the rarest item imaginable if there is something unusual about it. Take this stamp as an example. Anyone seeing this in a collection would be hard pressed to make a case for keeping it. 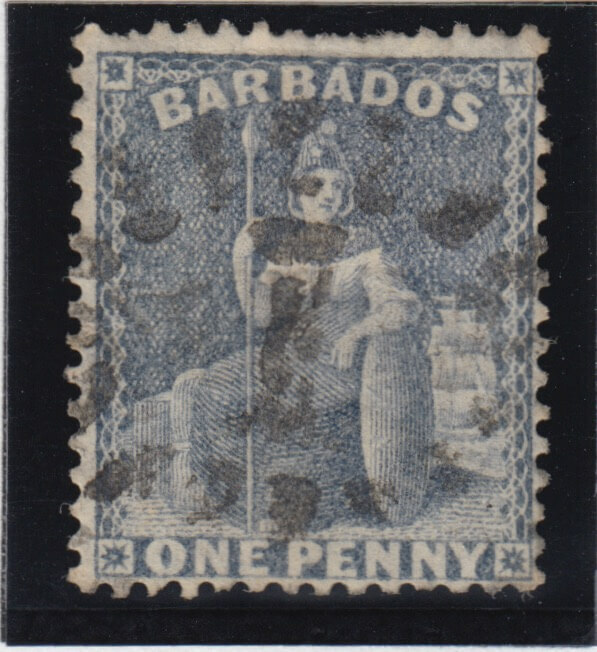 It’s one of the commonest Victorian stamps of Barbados, it’s missing some perfs across the top and it’s got the commonest numeral ‘1’ bootheel cancellation on it. With a nominal catalogue value there’s vary little to commend it and in most cases it would be destined to be in remaindered lots for the rest of its existence. Or the bin! But this little stamp has something special about it and it’s the ordinary that makes it extraordinary. 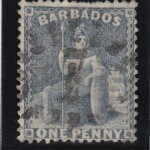 The stamp, SG73, was issued on Barbados in 1875 and between then and 1882 when it was superseded by the Victorian keyplate type, over 2.3 million of them were printed and distributed. This makes it one of the commonest Barbados stamps available. As the prevailing inland postage rate at the time was 1d this stamp was in huge demand and finding used examples of this stamp is not difficult. 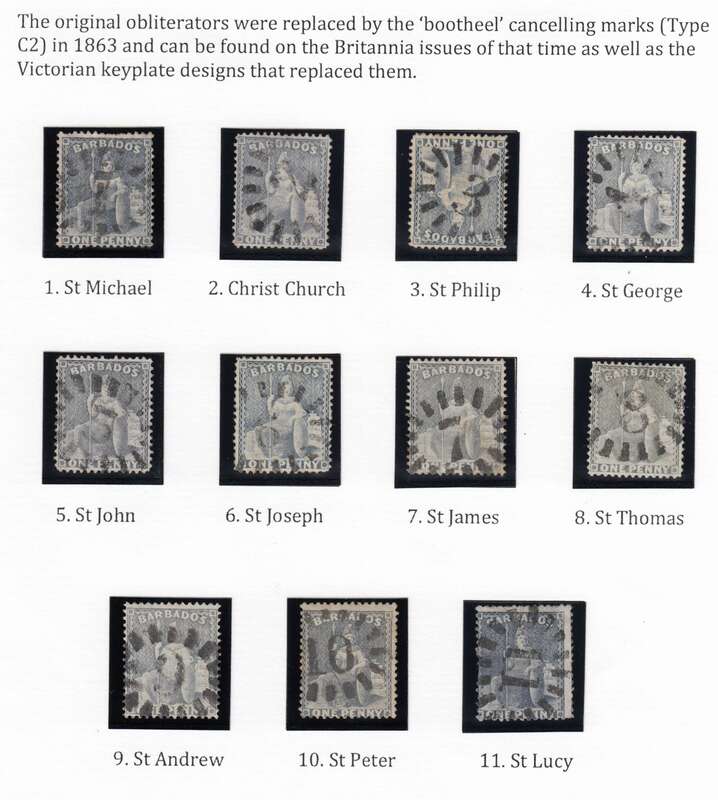 For collectors of postmarks however, there is a challenge, which is to collect all 11 parish bootheel marks on this issue, and this is something of a quest. It is generally accepted that with most of the bootheel marks on these De La Rue Britannia’s, the available set runs from 2 to 11 and excludes the numeral 1 bootheel of St Michael. This is because the numeral 1 was used at the main GPO in Bridgetown and due to the volumes of mail going through this office they adopted newer cancellers much earlier than the outlying parishes. So, the GPO numeral 1 bootheel is known to have been in daily use between 1863 and 1878 and with this stamp, SG74 being issued in 1875 there is, in theory, a three year window of overlap. In practice, however, they are hard to find. More commonly on this issue, you find the open bootheel, without the parish number inside, which was used from 1887 in the GPO, or the Circular Date Stamps that the GPO used extensively between 1863 and 1878. Having shown this stamp to other collectors there has been a mixed response so far. Some have suggested that it might be the effect of two parish cancels overlaying each other and doubling up to appear as a ‘1’ whilst others have concluded it is the genuine article. I expect the only way of proving it one way or another would be to get an expert certificate on it and that may lie ahead in the future. In all my years of collecting I have found only this one SG73/74 stamp with the numeral 1 bootheel cancel on it and as a dealer I know always says ‘show me another one’. So, whilst it is all too easy to throw common stamps into a spares box, or in many cases into the bin, just think before you do this next time as that common stamp might have a tale to tell.